My children have actually made their own Halloween costumes every year. Although this sounds noble and intentional, it actually began more for economic reasons. I just couldn’t imagine spending their clothing budget on cheaply made costumes, and I haven’t ever known how to sew, the reason we’re all learning now. Ahem. In the past, they have used old dress-up, paper, toilet paper, tape, and other art supplies, some of which you might remember last year. As I mentioned in this post in August, I have really tried to include handwork as a larger part of our learning this year. 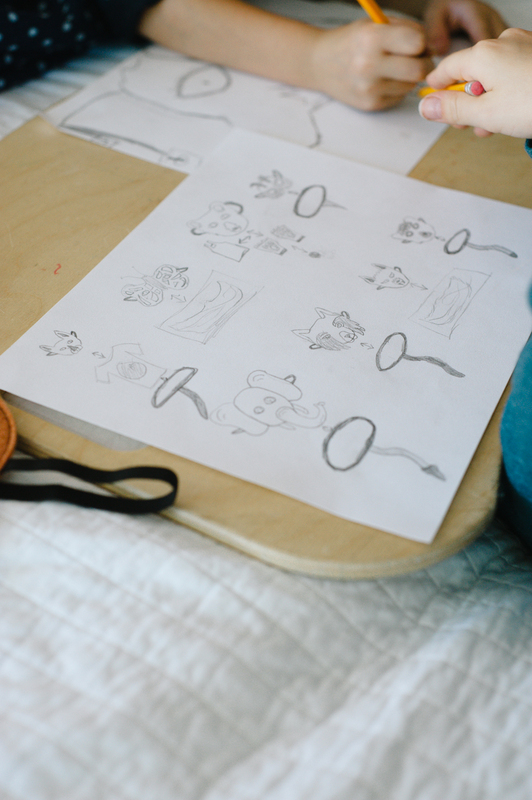 I don’t necessarily have a specific goal in mind for these skills, only that I know children generally love making things and as an adult having skills to make things can be quite useful. To begin, I’ve chosen a few general and somewhat foundational skills that might grow or apply to other interests down the road. Mostly, they are lessons I hope to learn right alongside them. (Wink.) We began with sewing, using the book Sewing School, based on a good friend’s recommendation, and the pace, images, and projects have been a perfect start for our novice group. 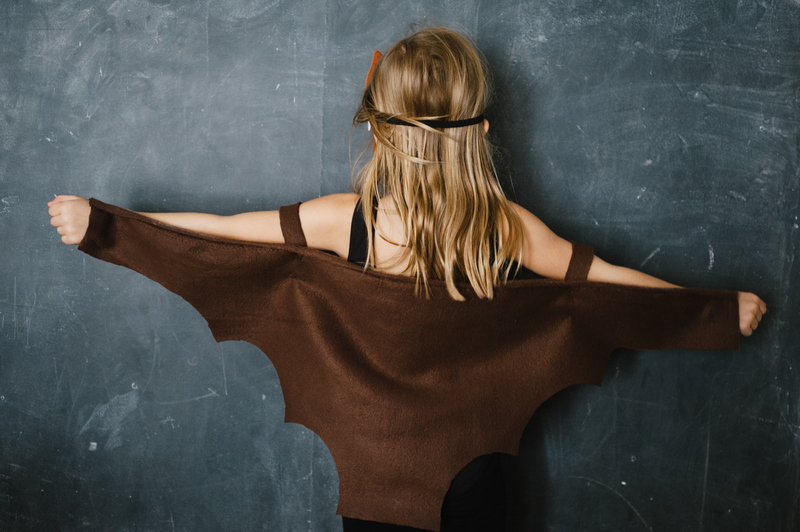 As Halloween has neared this month, costume making seemed the perfect, fun way to put our new skills to use. Early on, Olive decided she wanted to be a baby bat, using a play mask we already own. 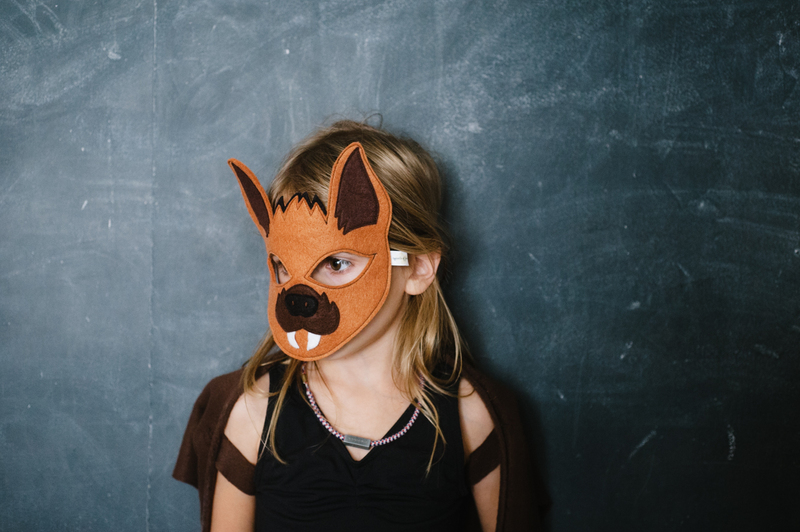 Each month this year, the kids have received a play mask of an endangered animal in the mail from Opposite of Far, a part of their mask of the month club. 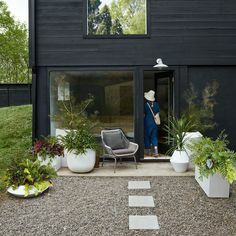 (I wrote about some ways we’ve added them to our learning here last spring.) 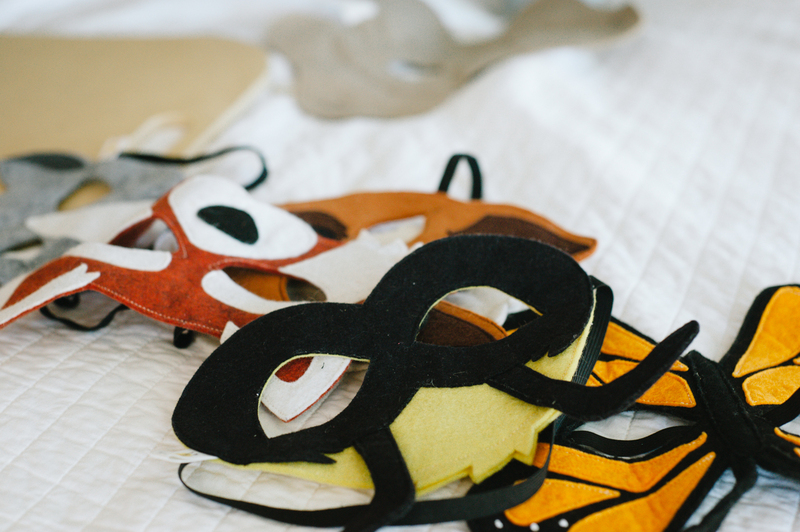 Blythe, a natural lover of design, wanted to take the masks and create costumes for each. 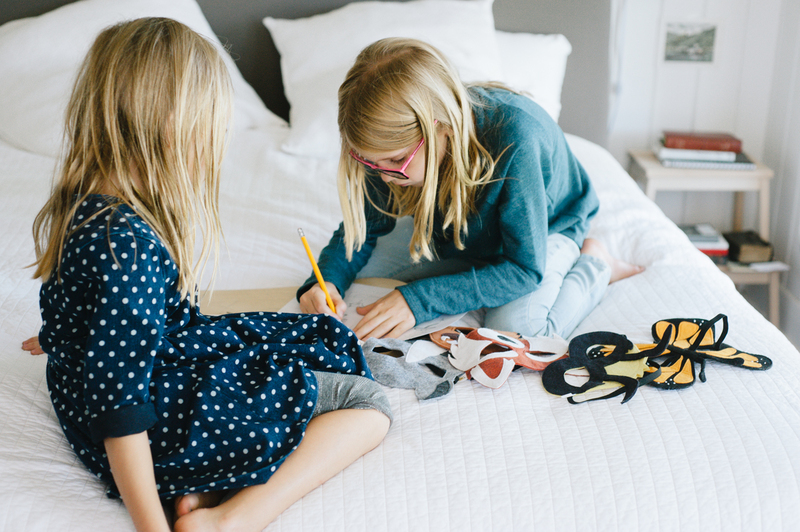 Olive joined her, and one entire afternoon they sat on my bed discussing ideas and plans for everything from paws made out of socks and paper to tails made from boas and shirt bellies covered with cotton balls. Since Olive opted for the bat, wings were a must, something easily coupled with her black dance leotard. 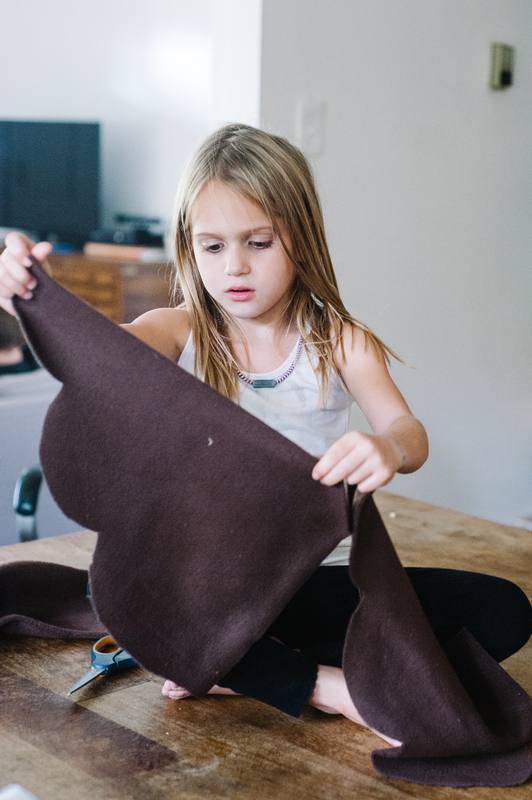 We shopped for a bit of brown felt at the local craft store, where I let each of the kids pick up a little something to add to their costume projects. I folded the felt and drew a simple pattern in chalk for the girls to cut, and then we pulled out the needle and thread and set to work attaching little bands to slide her arms through. She thought my idea for sleeves sounded far too hot. I tied knots in the thread for Olive to begin. She still needs quite a bit of help, mostly because she gets distracted. When she lost interest and went outside to play, I finished the sewing, although I sort of regret doing that now. Instead of finishing, as she asked me to, I wish I would have simply shelved it until her interest returned. Live and learn, right? I sadly don’t have any images of her sewing this project. When Olive has a needle, all eyes and hands are on deck–I totally missed the photos. Still, you can piece together the idea. 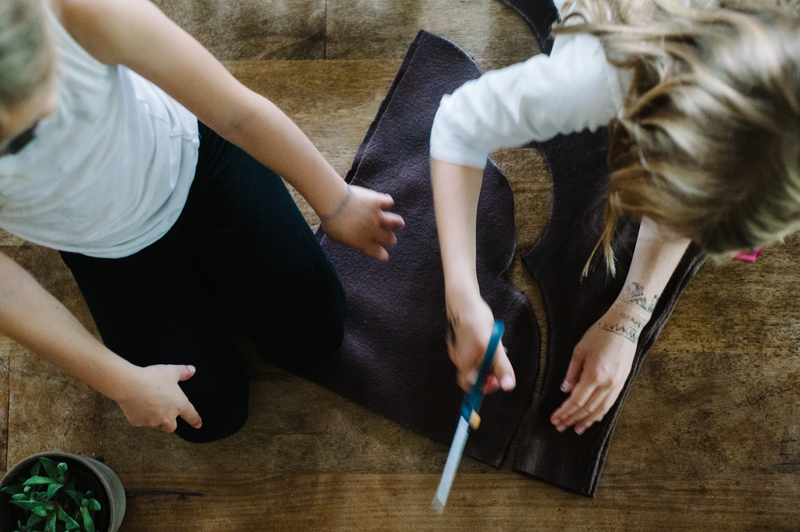 Although our sewing skills are still quite amateur, I like that we’re all (myself included) having to try something new, and when we fail or mess up–that happens often–we learn lessons about trying again or improvising. 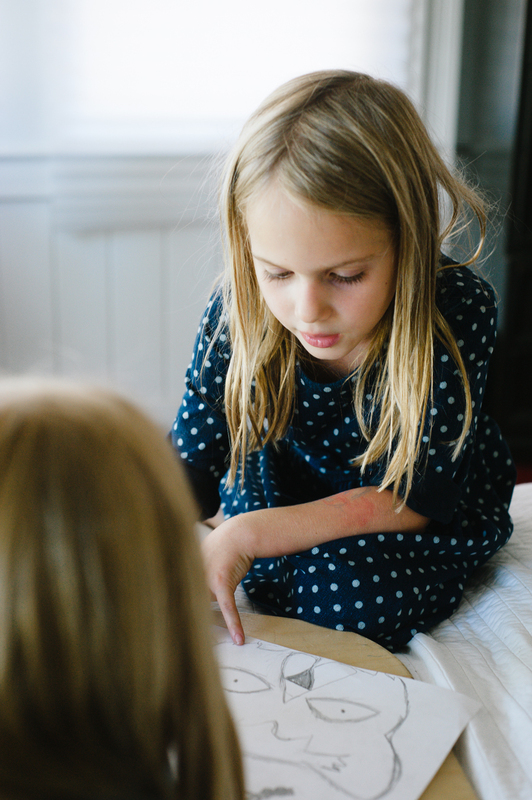 As I said, all of it is foundational, bits we’re learning through playfulness. This post was sponsored by Opposite of Far, a small business providing high-quality, handmade “tools” to parents and children for a richly imaginative and playful childhood. As always, all thoughts and images are my own. Thank you for supporting businesses that help keep this space afloat.